When news broke that co-founder Andrew Silver had left Zocalo, his longtime business partner Ivan Rekosh assured regulars that the restaurant would continue largely unchanged, although he did say that he had some interesting tweaks planned as well. First up, weekly jazz nights. Starting October 24, Zocalo will host live jazz every Tuesday night from 7:30 – 11:00. The relatively early start time is by design, to allow folks other than night owls to catch some good live music. For the first set, from 7:30 – 9:00, music will be on the quieter side, Rekosh says, so guests can enjoy jazz during dinner from one of Charlottesville’s most reliably excellent kitchens. Then, from 9:30 – 11:00, they’ll turn up the volume. The jazz is the brainchild of Zocalo staff members Peter Larson and Jack Sheehan, both graduates of the Berklee College of Music. Larson and Sheehan wanted to provide guests a way to enjoy some of the great local jazz scene, without having to stay up into the wee hours of the night. Stalwarts like John D’earth and the Kane-West Organ Trio are already on the schedule, which launches in just two weeks. He’s an acclaimed chef who once ran the kitchen of a Relais & Chateaux property. She’s a beloved sommelier, wine writer, and podcaster. What Tucker Yoder and Erin Scala share is a love of Jura, the French wine region between Burgundy and Switzerland known for eccentric grape varietals. For years, Yoder and Scala have wanted to team together for a dinner showcasing the region, and now they are. 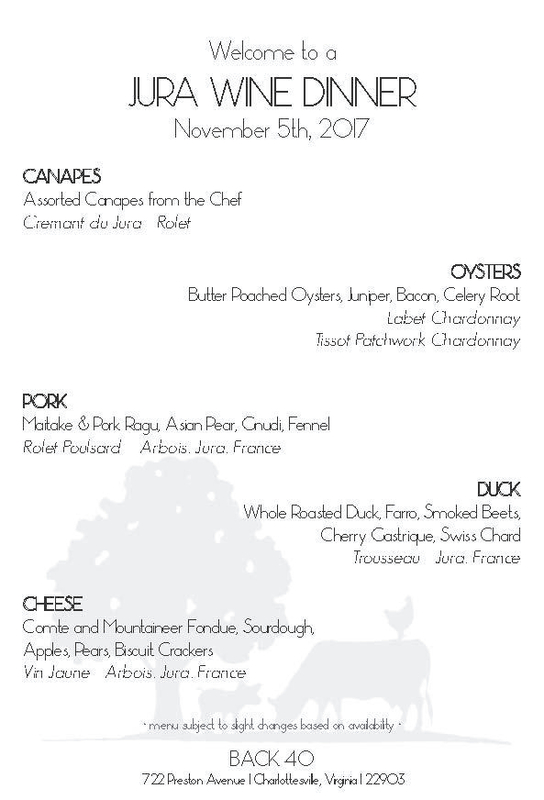 The dinner is Sunday, November 5, at Back 40 restaurant, where Yoder is head chef. Menu below. (“I’m just here for the food!”?) Tickets are $115 each, and only 20 will be sold. Get yours here.